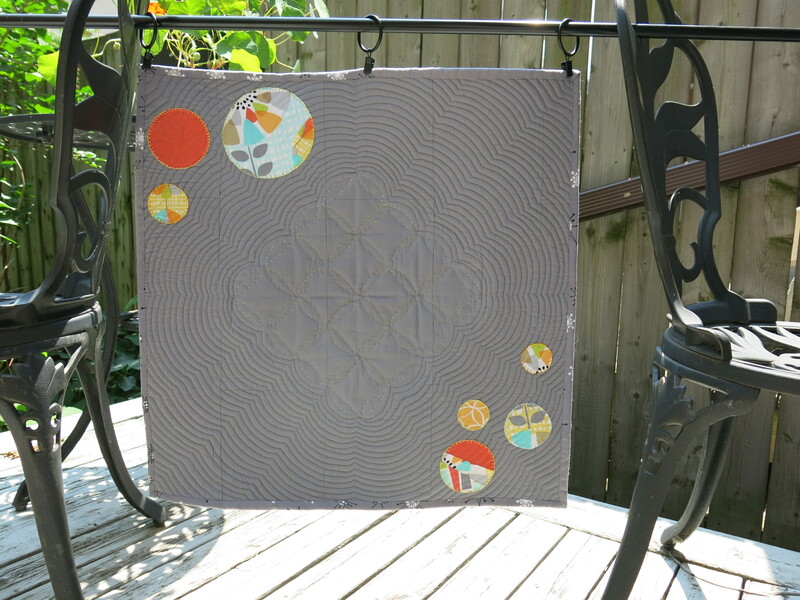 The Modern Quilt Guild organized a quilt challenge with Michael Miller fabrics. 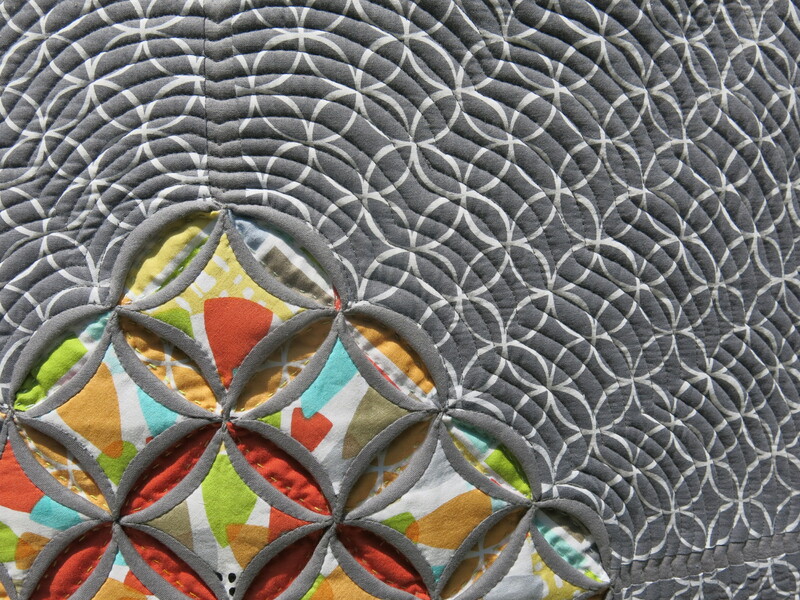 You are allowed to make anything as long as it’s quilted and made with other Michael Miller fabrics or solids. 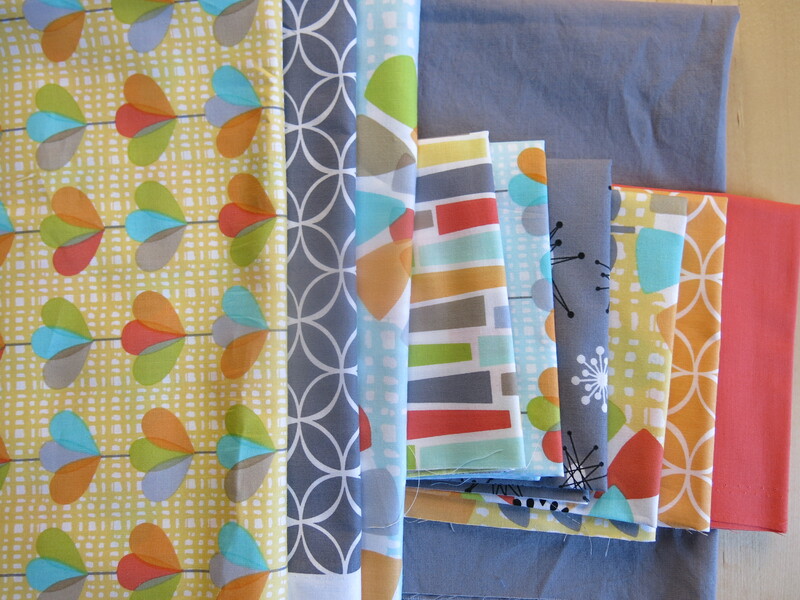 I received six fat eighths for the challenge, and bought some coordinating prints to add. The smaller pieces in the photo are the challenge pieces. 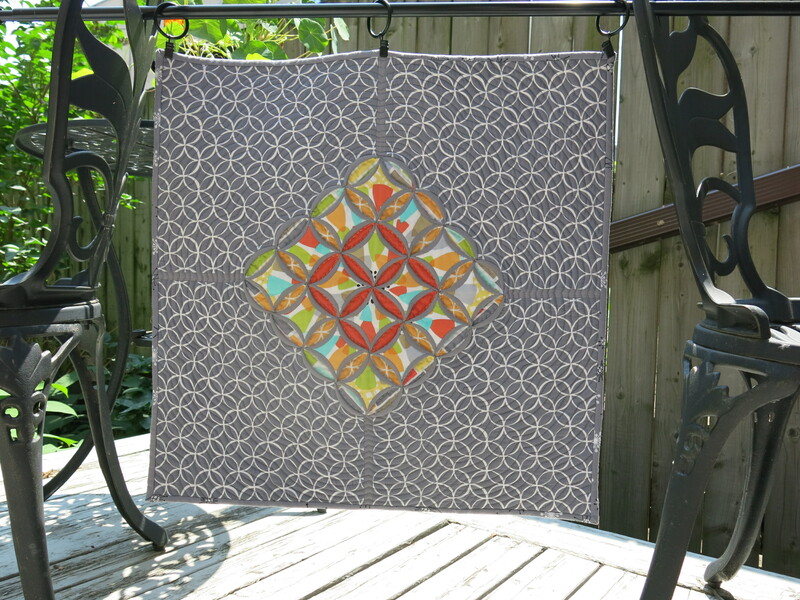 The pattern of the orange and grey fabrics remind me of the cathedral window pattern, so I thought I would start by making those squares and build on it from there. I made a 4 x 4 piece of the folded squares stitched together. I fussy cut the fabric to make floral pattern expanding from the centre. I put a white fabric behind each coloured piece because the grey showed through a bit. I ended out trimming the corners partly because I thought it would look better in a diamond orientation and partly because I was tired of hand stitching the edges. I was excited to see what it would look like with extra fabric so I sewed the grey print to set the cathedral window pattern in the centre before I finished the hand stitching. There are two layers of cotton batting. To account for the extra thickness in the middle, I cut out the centre of a first layer of batting. Detail of adding the batting to even out thickness. 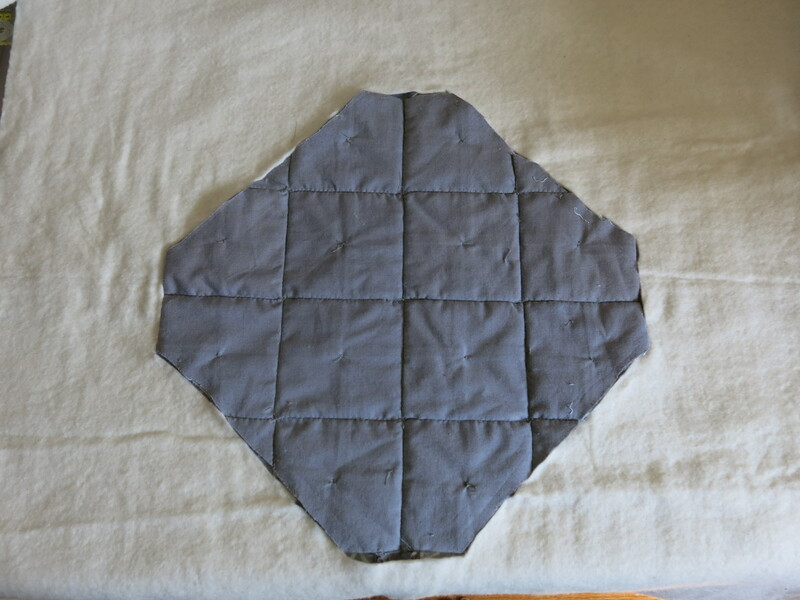 I used 50 wt grey Aurifil thread to quilt the outline of the centre shape repeating outwards. I hand quilted in the backgrounds of the cathedral windows with orange, yellow, green and blue perle cotton thread. The binding was made with solid grey and the grey print provided for the challenge. The finished size is about 22 x 22 inches. My original plan included sewing circles into outside piece of fabric or into a border. After I changed the design, I didn’t want to waste the circular pieces so I appliqued them to the back. The back embellished with applique circles. Overall, the challenge was a lot of fun! 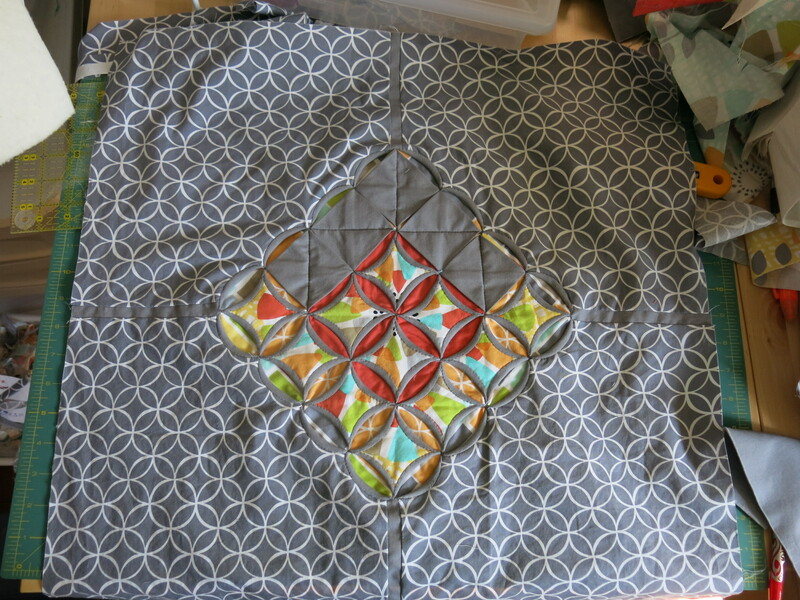 The cathedral window pattern was very time consuming, so I can’t imagine making a bed-sized quilt. It was a mad rush trying to finish it this week, but I’m happy with the finished product. ← So many WIPs, so little time! Adorable! I like the colours. Emily that quilt looks amazing! The detail, wow!! Félicitations Emily. Très original et les couleurs sont bien agencées. Beau travail! You certainly have my vote. This quilt is fabulous and is perfectly matched with the fabrics. I absolutely love it!